It's always great to hear how the ministry has touched someone. Here are a few excerpts from emails I have received. Last names and location details have been deleted for privacy. Wayne, it was so good to meet you and your wife on the flight. Thank you so much for the lovely gift of mission crosses to go to Nigeria and Ghana. We will take them with us around the globe as we share the love of Christ with believers and non-believers. Wow, you have massively blessed us! Thanks so very much for the crosses which will now go to South Korea, Thailand, and India. Our teams will carry and give them with all the love and care that you took to make them. Thank you so very much! And Kellie really enjoyed meeting you when you brought them by our office. It is great to have re-connected with you and to partner with you for the Kingdom! I wanted to update you on the crosses you made and donated for our mission trip. We have just returned from Panama where the crosses were decorated with colorful ribbons and an inscription put on them naming the new church that is being constructed. They were hand delivered to a school across the street and our ladies handed each student one personally (The principal was in total agreement to do this.) Then the ladies walked the neighborhood and distributed more of them. Your hard work and donation of the crosses was a big “hit” for this particular mission project. I sincerely appreciate how you contributed to our mission. You are so generous and that is most appreciated. My name is Gene. I serve as pastor at the Dallas Life homeless shelter in downtown TX. 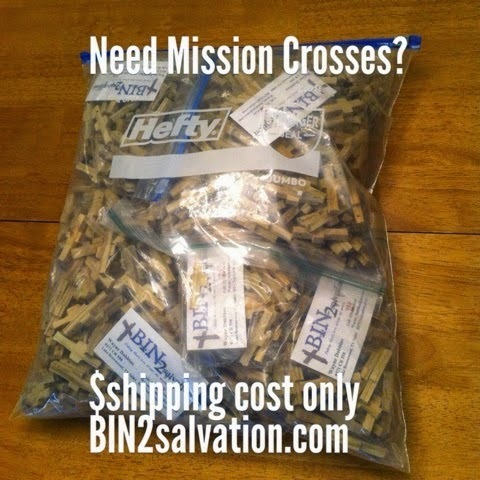 My wife and I are members of Hillcrest Baptist Church.... A friend of mine, gave me a bag of little wooden crosses for the homeless people here at Dallas Life. I have been giving one to every homeless person I speak with and they are very appreciative to receive it. You can easily tell a resident of Dallas Life Shelter now because of the little wooden cross they wear. They are on strings around the neck, on homemade bracelets and attached to their ID badges. Some are still natural wood and some have been colored. In any case these little symbols of God’s love are all over the homeless shelter. Thank you for the crosses and God bless you. I received my cross from Vic last night at our men’s (barbershop chorus) rehearsal meeting. Checked out your website today and found that this ministry sprung from AGAPE at your Walk to Emmaus. I am a graduate of Walk #35, Table of Paul, Little Rock, Arkansas. Keep up the great work, so good to see the reports from Honduras, Africa, etc. I am writing you a note to let you know how much your wood crosses are appreciated. We took a large supply to CTC Annual Conference in June and we came home with none. The folks were excited to take them back to their churches to use them in so many ways – especially with Vacation Bible School. I also heard of using them at a funeral. The family pinned the cross on themselves, and when someone came up and talked to them about their loved one, they would pin one on them. Pretty soon everyone was wearing a cross. I personally took over 100 to a Children’s Home in Mexico. The home has started a church and a youth group and they are going to use them at one of their youth gatherings. The wheels in my head have been turning and this is what I am thinking we will do. We would present our mission crosses to our trip participants during their commissioning, then they would be empowered to share their cross with someone that they meet on their trip, regardless of where it is . And all that we ask is for them to share with us what moved them to do this and who they shared it with. Thanks so much for all the crosses. They will definitely be a blessing to those we serve in Haiti. Thank you as you are a blessing to us. I'm Glad to have met you, and proud of what your a'doing for the kingdom. I remembered that you make wooden crosses. I'm a member of the Patroit Guard Riders, its a group of mostly motorcycle riders and military vets who attend funeral services for our nation's fallen heroes. Most of us wear a vest with various military and Christian patches among other things like spent shells from the KIA funerals we have attended. I would love to get some of your crosses. ...later...Thank you, I will make sure everyone knows where they came from. It's a huge honor to be able to make sure these men and women get the respect they earned and deserve. Tomorrow we are doing 4 missions (that's what we call a service), each is for a homeless vet. There is a funeral in the area that donates all the mortician services and a casket and a hearse. I've done these a few times and we are normally the only family this person has. Sometimes a nurse from the VA who might have helped him or similar will show us but each of them will have their own service with the respect and dignity they deserve. Knowing they will then lie with their brothers and sisters in arms is a great feeling. I heard you tell the stories about where your crosses had been and I thought this would be a great place, where they can honor the two people to give their life for US: Jesus, who died for our souls, and the American servicemen who died for our freedom. Wayne, We have your crosses out on the counter for people--"free Choice." The lady from Clyde is distributing them like wildfire and insisted on sending you the enclosed check to help you some. Hi, I have never been so blessed! It has been so much fun giving a cross to people I meet, as well as those I fellowhip with. Thank you so much! I want to just say thank you for being a part of this trip to Uganda by supplying the crosses. We had a baptism that we handed them out at and people were so happy to get them. We left the rest with the translators we worked with and they are going to hand them out also. Thank you so much for your contribution to this trip! The crosses you gave me were given to Elisabeth. She gave them to David from around Cross Plains. They are in air right now to Russia. David is with a group of religious people going there. He plans to pass them out to the Russians. I told Elisabeth that she is the messenger, and you are the maker. Any way to get God circulated around. This is an incredible ministry. Thank you so much for sharing and allowing us to be a part. I am excited to see hos God uses this ministry in Alaska. We will be working with Alaska Missions while in Kenai. Every year they help aid the event "Salmon Frenzy". Natives from all over and all ages come. We have the opportunity to feed them, build relationships, and do a back yard Bible School for the kids. Dear Sir, I would like to know if I could get some of the mini crosses that you make. There is a lady at church that's collecting for diapers every time I go to church. I think it is a good idea for her to give away a free cross every time she receives a donation. 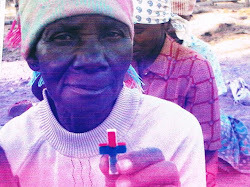 A friend of mine is going to Nairobi, Kenya and to help out I would like to get him some crosses for him to stake since I can't go. He will be going to the slums of Nairobi and bring the Gospel and healing to the people there. I was looking at some videos on carving comfort crosses and came across your video. Your video (which was kind of funny, you know OSHA standards), was a Godsend for him to take crosses to Kenya, and later, in January, to Mexico. He thinks he will need 5000. We need about 1000 crosses with side holes. This way we can slip a small string through them and put the Cross on a bottle of water to be handed out at parks in Gwinnett County, Georgia. We have been doing this for over 18 months and praying for people on the spot. It is a ministry some of us have really been blessed with. Your crosses will be more impact for the Lord, along with the paper information that we hand out, too. May you have a blessed day as you walk with the Lord. Thank you so very much for the crosses, the children loved them. Please thank all the kiddos from your church for their loved and support and let them know that their brothers and sister in Haiti are grateful. Hello Wayne, I found you on the web today. I am on a team working to get a network of prayer walks established in our community. I would love to be able to use the crosses you make in this mission. Thank you for sending them to me. I love what you are doing! I am very interested in your wooden crosses to take on a missionary trip to Belize in June of this year and I will need 2000. Thank you so much for filling my order. I learned of your ministry of love for the Lord. Our ministry plan is simple: we go to where there is a crowd of people and talk to them about the Lord one on one. We use conversation starters to open the door to the Gospel. That is one of the ways I plan to use your wooden crosses. I will give them one and ask, "What happened on a cross 2000 years ago and what does it mean to you?" The next even is the Cornbread Festival in South Pittsburg, TN, in April. Thank you for the crosses and your ministry of love for our Lord Jesus and His Kingdom! We are enjoying giving them out and we are having a great response. Almost without exception the people are glad to receive the cross and are open to hearing the good news of salvation. Anna is going on a mission trip to Podgorica, Montenegro and Johvi, Estonia from April through August. My vision is to have the Crosses placed on the Alter before the service, present the crosses to Anna. I am excited about doing this for Anna and all God's people. God and I have been taling about this for some time and I have experienced all of the anxiety, excitement, nervous, restless motions possible about this event. I guess God is building me up for something Big and Bigger, so I am ready to say; LET"S GO GOD! Diane gave me some of your crosses in Louisiana, to take on a mission to Cambodia. The mission team strung them on cord, and we passed them out while we were in Cambodia. Pictures are attached of 190 Bible School students in Phnom Penh. There was a gathering of students who are going to school on scholarships partially supported by out church, the two Bible Schools Reaskmey and Sam Rath Methodist Churches in Kompong Thom and the girls and boys who live in the dormitories on the Sam Rath property so they can go to high school. The crosses were a big hit. The children loved them, and so did the adults. We left some with the missionaries there, when we left for Vietnam. While we shopping in an enamel factory, a young lady asked me where I got my cross. She said she loved crossed, so I gave her mine. Thank you for your generosity, and I just wanted to let you know that several hundred of your crosses are being worn in Cambodia by children and young adults. I am with the children's ministry of my Baptist church in South Carolina. 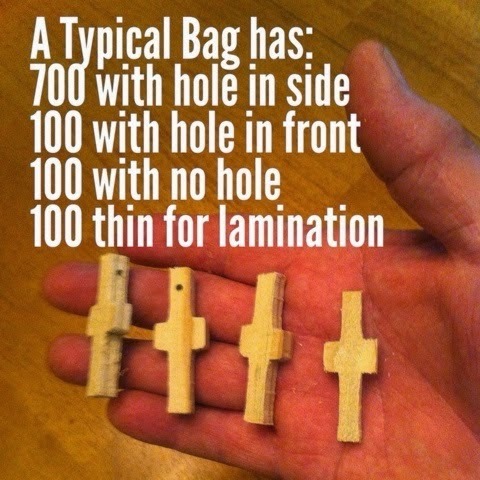 I would like to get a large bag of your crosses for our kids to hand out in the community as well as on the trips we have planned for them this summer. We were home missionaries for over 35 years and took the gospel to the streets of America's ghettos and neighborhoods. Currently we're in the process of building a website called Witness Depot where we'll be posting witnessing audios, video, booklets, tract, and tool from missionary and evangelism ministries. One of the witnessing tools we use on the streets is the cross. We would like to see if you can build, and ship us a 12' cross, that can be broken down to put in a bag and go through customs at the airports. 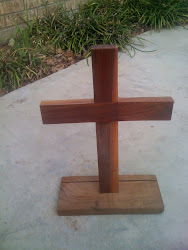 I was looking for a "how to" make small wooden hand crosses and found ykour video. While I learn from your video, could I buy some from you? I plan to walk our city and leave palm sized crosses on doorsteps with a note inviting them to know Jesus. Thank you and God Bless you and your work. Headed down to central Missouri this weekend with the last of the crosses you sent me, Nd hopefully, I'll return empty handed. Also, if you could send a bag of around 300 crosses to this address (thick ones with a hole), they will go to a ranch manager's wife and she could use them for Rodeo Bible School this summer. It can be a lonely life in that part of the country for some of those kids and their parents, and the ranch hands, so extra prayers for God's presence and love. I just wanted to write you a note and tell you how much I appreciate what you do, making the crosses. I always have some with me and have met some very interesting people because I am constantly on the look out for someone to give one to. * I have a box of them on the bathroom sink with a note for people take one at Church. The note encourages them to remember the amazing Love that God has for them, to hold for comfort, as a reminder to give up their cares and worries to God. (I have a hard time keeping crosses, they go fast.! * Gave them out at a Prayer and Praise night. * Gave as many as I had at the time to a Pastor at the UMCA in Estes Park, to keep on his desk for the many people he counsels. Many employees that work there are far from home. * Scattered around a local beach area by the lake where high school kids are known to hang out. * As I mentioned, I have sought out people that I might not have spoken to and have had meaningful, intentional conversations with them...and not one has turned down a cross yet! * Prayer Boxes in our local Care Center and Assisted living apartments. They can hold and pray with a cross and then I/we will take them on a prayer walk through the woods around our local lake/reservoir. * A Prayer Box at the Ronald McDonald House by the local Children's cancer center. * A Prayer Box at the meetings of addiction recovery programs and at Parent meetings for kids with Heart Defects. Thank you again. I am going to continue to reach out so the world around me-God's Love aCross the globe. We will be using these in VBS for a craft for the older teens. They will sand and attach cords. These will be worn by our kids to school and sports events, etc. When asked why they are wearing them (they will wear three) they will take one off and give it to that person and tell them about Jesus. Hopefully, children will be brought to the Lord through this ministry. Thank you so much for this wonderful work you do. We are so happy you could rush us an order! Thank you for the wooden crosses. I will deliver them to the ladies at the mission, for them to paint, or create something we can bring back to the states to our church bazaar. We can sell them and send them to money for the mission in Costa Rica. I have to say this year I turned 29 years old. I followed the devil for most of my life. But the Lord had a plan for me. He kept me thru all the bad I have done in my life. I have 3 children that have been raised in church but it was their grandparents taking them. My wife and I dated for 8 years before begging married. I always have known I loved my wife and kids but wen I accepted Jesus Christ into my everyday life I truly now know I love my wife and the kids she and the good Lord have given me. I started attending church with my wife and kids. I took that step on Jan1,2017and the good Lord has been with me ever since. It was a feeling I don't have words for. Since then I have pressed to le my light sine to anyone that's ready for something so good and free as Jesus Christ. When I let him everything else fell into place. I have made around 200 crosses big and small and I have carried them in my truck to give away to anyone whom needs or just wants one. I don't worship the cross but the story behind it. My pastor and I were at our church working one afternoon and I asked what's something you'd like to do and he says let's build an altar, nothing fancy , a 12 foot 2x12"sanded with legs. Stained with poly. I have seen 50, or more people give their life to Christ kneeled at the altar that we built. It is just amazing to me that God used a carpenter like me to bring people to Him. God Bless you and thank you for what you are doing for God. I know He appreciates it and its a blessing to me to see a carpenter like you working for the same God I know and serve. I never knew I had a brother in Texas. If I never meet you here on Earth, my God bless you, and be with you every step, everyday! I'll meet you up in Heaven! I really like the idea of passing out crosses, when I go out to the street and witness to the lost, preaching the good news, Jesus or Lord and Savior. Thank you so much greatly appreciate all that you are doing. May the Lord richly bless you and your family. Jesus lives and His love endures forever. We want to show the movie "Do you Believe?" to our youth group, and give each one a cross. The movie emphasizes the importance of having a cross to hold and carry around with you. May God continue to bless and walk with you each and every day. Thank you for spreading His message. Just finished watching your video and I thank you for doing the Lord's work. I have been looking for small wooden crosses to give to people. I do inspections for insurance companies and meet so many people daily. I would love to be able to hand out wooden crosses to each person that I meet daily. Some days I get way behind in my appointments because the previous appointment contact and I start talking about Jesus Christ and time gets away from me. A few weeks ago I talked to a lady that was really going thru a hard time and we started talking about Jesus Christ and while I am not ordained I felt like I was ministering to her. It would have been so fantastic to have been able to hand her a wooden cross. I just got out of the hospital with a stroke (I'm only 42) and run a Non-Profit , designed to provide support through faith for those suffering from Depression, Bipolar, Schizophrenia, PTSD, and other mental Disorders. After watching the movie "Do you Believe" I recognize the power of the Cross. Maybe a Cross can Save A Life, maybe it can encourage someone when they're depressed. Then we found you! God bless you brother for what you are doing. I will make sure your CROSSSES REACH EVERYWHERE AND EVERYONE'S hearts. First, let me tell you how people are loving the message of your crosses. Thank you so much for your efforts. We have a youth group, Mad Hoops, that meet weekly to play basketball. These are at risk youth and the Director was so happy to take crosses to hand out to his boys (around 100 boys-young adults). We also serve food and minister to the homeless in Charlotte twice a week. Your crosses will be a blessing to those seeking help. Everyone I have given a cross has been so thankful to have something to carry in their pocket. Everyone loves a reminder of God's love. Just wanted to know how much you are appreciated. Thank you for your generosity and service to God. Thank you so much for your precious and loving ministry to share God's love with others. My husband happened across your hand made crosses this evening and we think these are so neat! We are going with our church on a 2 week mission trip the to the Phillippines in July '15. We would love to share your crosses with the community where we will be working. Plans are we will build a church and ado a VBS with the children in the evenings. We're also planning to make visits with others in the community, if time allows. to talk to people about the one true Savior. We went to one school last week and gave away cross necklaces to each child. We worked in different classrooms and my partner and I had second graders. We went around the room and asked each child his or her name and then tried to say their names as I put a cross on each child and told them Jesus loves them and I do too, I came thousands of miles to tell them Jesus loves them! Literally brought tear s to my eyes and they were so so sweet! Many of these children have never seen an American so they were very curious about us. We did lessons on respecting elders, cleanliness, timeliness, and being polite and sang Christian songs with kids and took them snacks. I really like your crosses you have made, and I plan to use them for a youth event, and, also, part of them to pass out with our gospel tracts. Thank you so much Wayne. God bless you, my brother! hahaha. Just thinking Wayne and Kayne in business for Jesus! May our Lord n Savior bless you and your wife, your ministry, and your endeavors. Till we do more business or meet in Heaven! To God be the glory! I have a Music Ministry. I am retired and spend my time Volunteering singing avariety of songs to nursing homes and senior events, around the area. About 16 each month and over 500 people. I also make a little money serving as a Music Therapist each month. All of my programs are concluded with the Gospel message. I would like to give each person of of your crosses as token of the Love of Christ. I sanded them down and wrote the word "LOVE" on them. Every one is different and I tell people about you and your ministry and let them know that they have been prayed over a number of times. I usually pass them out after singing the song "Have I told you lately that I love you.?" I ask them if they have told someone today that they love them or have they prayed and told God that they love Him. Thanks for the "Love" that you have passed along to my ministry. It sounds like I am on the start of the same journey as you. I was a pilgrim on Walk in Texas. I decided to work on the outside team the next walk. I was assigned The AGAPE Room. The AGAPE on my Walk was not too memorable, so I decided to make some crosses. Not as many as you! I had some black walnut and started making nice 6" wall crosses...then was asked to make the table crosses, then the main cross and then prayer crosses. Of Course! I am on the inside team on the next walk and the Lay Director has asked me to do them again. Of course! I have, also, been asked by Nuns that have a cancer prayer group retreat to do more. Of Course, Not to mention the new Emmaus group for probationers has made the same request...Of course! I did get volunteer sanders from church. There is a God! I Love it and would not have it any other way. Everyone Counts! What a fantastic thing you have been doing with the crosses. I am, also, a retired school teacher/coach. If you are still making them, I would love to cover the shipping and make you a donation. My Sunday school teacher's wife started Hope For Eternity (www.hopforeternity.org) in 2010 after their daughter adopted two children from Ethiopia. She created this mission and at this time there are 12 churches in the cities and 20 churches in the rural areas in Ethiopia. The crosses would be great for her to take on her next visit or send them over to the Missions. Please let me know by email if you are still doing the crosses. The crosses have arrived and they are perfect for our pocket quilts. We are so thrilled that this year again we can give out our coast to children throughout the county with such a wonderful message for them to find in the pocket. Bless you for your time, dedication and generosity in helping us spread the word of our Lord to those who perhaps do not hear the message at home or in school. We are keeping them physically warm with our clothing and, thanks to you, we are wrapping them in God's love, also. Thank you again for your wonderful work; it is deeply appreciated. Wow, It sounds like I am on the start of the same journey as you. I was a pilgrim on Walk 1761, 2014, CC Texas. I decided to work on the outside team the next walk. I was assigned The AGAPE Room. The AGAPE on my Walk was not too memorable, so I decided to make some crosses. Not as many as you! I had some black walnut and started making nice six inch wall crosses...then was asked to make the table crosses,then main cross and then prayer crosses.Of Course! I am on the inside team on the next walk and the Leigh director ask me to do them again. Of course! I have also been asked by Nuns that have a cancer prayer group retreat to do more.Of Course, Not to mention the new Emmaus group for probationers has made the same request...Of course! I did get volunteer sanders from church. There is a God! I Love it and would not have it any other way. Everyone Counts!